Growing your own food is one of the most important things that a survivalist needs to do to be self sufficient. The source of this food will all start from the seeds you plant in the soil. What type of seeds you use to start your garden can have a huge impact on the quality of food you produce as well as its abundance. Not all seeds are created equal. Here are some important factors to think about when selecting what seeds to plant for your garden. Heirloom seeds come from a group of plants that have been open pollinated, selected for desirable traits and have been cultivated for years through human history. Open pollination means plants have been pollinated naturally by wind and insects. Seeds produced from large populations of plants in this way guarantee good genetic diversity and healthy generations of plants that can adapt to different environments. Seeds can be selectively saved over generations to pick the traits the gardener wants. If you save the seeds from these plants, you can expect future generations of plants to be fairly similar to its parent plant. For self sufficient gardeners who wish to save seeds from their plants for the next season, heirloom seeds are a must! Hybrid seeds are seeds produced from first generation cross pollinated plants. Plants grown from F1 hybrid seeds tend to be very uniform and vigorous, which is why they are often used in large scale agriculture because their results are very uniform. The plants tend to fruit and ripen at the same time and can be harvested all at once, which is great for large scale harvesting. The one problem with hybrid seeds is the plants they produce are not very good for saving seeds for the next years crop. Seeds from hybrid plants are sometimes sterile and if they are not they will often produce plants that can vary wildly from its parents producing non-uniformed plants that can have all kinds of undesirable traits. Growing from hybrid seeds would require you to purchase new seeds every season. 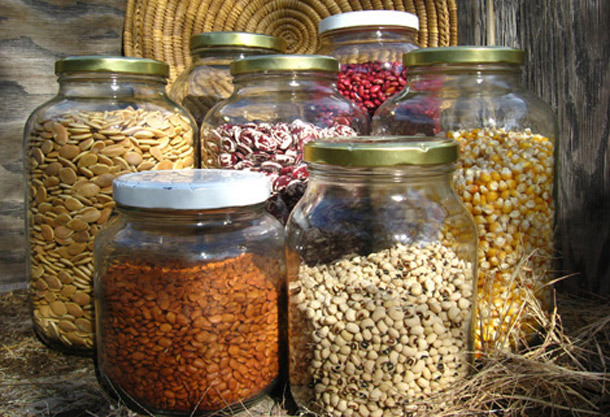 Seeds for sale in supermarkets and large retail stores are usually hybrid seeds. Genetically modified (GMO) seeds will produce plants that have been modified to enhance desired traits such as increased resistance to herbicides or improved nutritional content. One concern of GMO seeds are that they contain gene combinations that do not appear anywhere in nature. It’s possible that GMO crops grown outdoors could cross-breed with other non-modified crops close by causing these genes to cross over and contaminate natural crops. GMO plants often produce sterile seeds so that farmers have to repurchase seeds every season. If these plants were allowed to cross breed with other similar natural crops, making them sterile, it could cause devastating effects to the world’s food chain. Open pollination is the key to a healthy garden and successful seed saving. Plants that reproduce naturally over time tend to thrive and adapt to their local conditions, evolving into reliable performers that will create a healthy and robust garden.